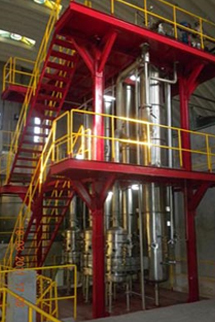 Evaporators are used for concentration or crystallization of liquids. In most of the cases evaporators are used to increase the solid contents of the liquid product prior to drying. This is a cost effective method of removal of moisture. Depending on the number of effects used in an evaporator the quantity of water evaporated per kilogram of steam increases. In case of multiple effect evaporators, steam jet ejectors or thermo-compressors are used to increase the thermal efficiency. Copyright © 2011 by Raj Group. All Rights Reserved.